President Donald Trump speaks during a news conference with French President Emmanuel Macron in the East Room of the White House, April 24, 2018, in Washington. U.S. President Donald Trump vowed on Tuesday to look for common ground with his French counterpart in dealing with Iran but made no commitment to stick with the nuclear agreement he described as "insane" and "ridiculous." Alongside visiting French President Emmanuel Macron, Trump repeated his criticism of the agreement to freeze Iran's nuclear program in exchange for sanctions relief, saying it does not address Iran's missile program or attempts to stir up unrest in the region. 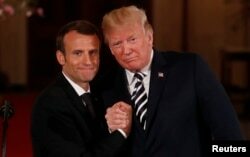 Macron, who will address a joint session of the U.S. Congress on Wednesday before returning home, has tried to persuade Trump not to withdraw from the 2015 agreement struck between Iran and a group that includes the United States, France, Britain, China, Russia and Germany. ​The French leader said he discussed with Trump the desire for "a new deal with Iran" that would also address the country's ballistic missile program and include a political solution to constrain Iran's activities in Syria, Yemen, Lebanon and Iraq. European Union foreign policy chief Federica Mogherini defended the existing Joint Comprehensive Plan of Action (JCPOA), telling reporters Wednesday it needs to be preserved. "The deal is working," she said. "President Macron stressed it yesterday in the White House very clearly that we believe that the full implementation of the JCPOA is essential for European security and for the security of the region, and the Europeans will stick to that." Trump gave no indication Tuesday as to whether he will pull the U.S. out of the existing nuclear deal with Tehran, but he issued a warning to Iran. "If they restart their nuclear program, they will have bigger problems than they have ever had before," Trump said during a meeting with Macron in the Oval Office. "You can mark it down." French President Emmanuel Macron clasps hands with U.S. President Donald Trump at the conclusion of their joint news conference in the East Room of the White House in Washington, U.S., April 24, 2018. Iranian President Hassan Rouhani dismissed talk of a new deal, questioning Wednesday what right the United States and France have to make decisions about a seven-nation agreement. Rouhani warned earlier of severe consequences if Trump does pull out of the deal. U.S. withdrawal could create major discord between key trans-Atlantic partners and throw the Middle East into even deeper turmoil. "Macron essentially dangled the prospect of a grand bargain with four pillars — the JCPOA, a promise by Iran to never develop nuclear weapons, preventing Iran from further expanding its ballistic missile technology, and addressing Iran's broader role in the Middle East — in order to try and keep Trump on board and to stop him from withdrawing from the JCPOA on May 12," American University School of International Service Professional Lecturer Garret Martin tells VOA. "It remains to be seen whether that will be enough to sway Trump, and if other major powers and regional players, including Iran, would even be open to a grand bargain." Macron also wants Trump to keep American forces in northern Syria to avoid the risk of giving up the country to the Assad regime and Iran. Trump told reporters that "I'd love to get out" of Syria, where the United States has 2,000 U.S. troops seeking to eradicate the Islamic State terror group. "We want to come home. We'll be coming home," predicted Trump. "But we want to leave a strong and lasting footprint." The U.S. president also criticized other countries in the region for not doing enough with their own forces to fight terrorism and to counter the Iranian threat. Trump said the United States had spent seven trillion dollars in the Middle East over an 18-year period and has "less than nothing" to show for it. U.S. President Donald Trump and first lady Melania Trump and French President Emmanuel Macron and Brigitte Macron prepare to have their picture taken on a visit to the estate of the first U.S. President George Washington in Mount Vernon, Virginia. Some wealthy countries there "wouldn't last a week" without the United States ensuring their security, according to Trump who declared — without naming any particular states — that they would have to step up and pay and put soldiers on the ground. "President Trump agreed that he didn't want to give Iran a free hand in Syria, but his solution was to have regional states — presumably Saudi Arabia and other Gulf countries — fund the reconstruction and humanitarian expenses and to provide their own troops to stabilize the country," said Jeffrey Rathke, the deputy director of the Europe program at the Center for Strategic and International Studies. Rathke, a former U.S. diplomat, tells VOA that Trump's idea "has currency in some Washington quarters at the moment, but is unlikely to gain traction in the region." A 21-gun salute echoed across the South Lawn on Tuesday morning while nearly 500 service members from the five branches of the U.S. military stood at attention to officially welcome Macron to the White House. Tuesday night, Trump hosted Macron and his wife Brigette for the first state dinner of his administration. The dinner came 15 months after Trump's inauguration, relatively late compared to previous administrations which typically hosted elaborate ceremonial sitdowns by the end of their first year in office. Tuesday's dinner was a relatively low-key affair, with few celebrities and big Washington names on the guest list. VOA's Victor Beattie contributed to this story.